(Rome) On the controversial post-synodal letter Amoris Laetitia, the Latvian Cardinal Janis Pujats spoke up. He was after the "turn" Archbishop of Riga. In 2001, Pope John Paul II took him to the College of Cardinals. On the same day, Pujats and Jorge Mario Bergoglio, today's Pope Francis, and three out of four members of the so-called Team Bergoglio in the cardinal rank were raised: Walter Kasper, Karl Lehmann and Cormac Murphy-O'Connor. It dealt with 42 new cardinals to the consistory with the most cardinal chapters in church history. Cardinal Pujats, in an interview with the internet newspaper La Fede Quotidiana (FQ) on Amoris Laetitia, called for a "clarification according to the Gospel and the everlasting Magisterium of the Church". Already in 2015, the Cardinal, along with nearly a million faithful, had signed a pledge of faith to the Church's unchanging teaching on marriage and its uninterrupted discipline. Q: Eminence, what do you think about the debate on Amoris Laetitia? Cardinal Pujats: You know, here in Riga I am a pastor in a parish. I am therefore a bit off the beaten path, but I am listening and informed. I'm an optimist and I think things are getting better and better. Everyone has to talk to each other, including the pope. One thing seems to be clear to me. Cardinal Pujats: The mentality underlying the text is too liberal. Today, I note a certain negligence towards Catholic morality, but also in Catholic morality, and above all against what are called non-negotiable values ​​and principles. Q: Is it possible to give someone the communion that lives together more uxorio or a remarried divorcee? Cardinal Pujats: No, that is not possible because they are not in the state of grace. These persons, to whom we are sure to have our care and pastoral attention, cannot receive sacramental communion. They are not legitimately married and are therefore in the state of mortal sin. All this is part of the sacramental teaching. An exception, if only possible in articulo mortis [on the deathbed]. Cardinal Pujats: What does that mean? The teaching of the church does not change. Nobody is allowed to do that. Everything is written in the gospel and is to be accepted. What are we talking about? Q: There is a document of Correctio filialis about Amoris Laetitia. 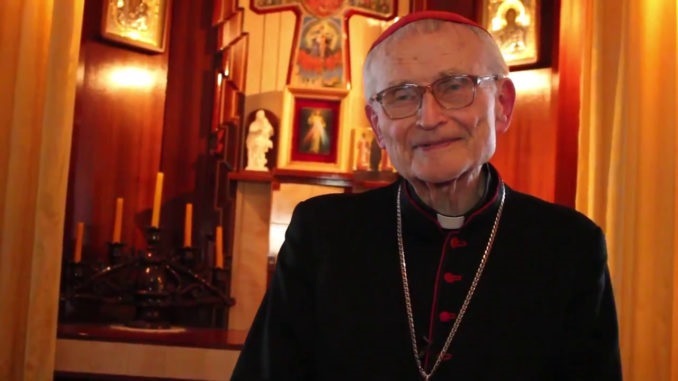 Cardinal Pujats: I believe that today, for the good of the Church and the people of God, clarification is required according to the gospel and the permanent teaching of the Church. The doctrinal clarity should never scare anyone. If already obscurity is harmful together with ambiguity and confusion. One must have the courage to speak clearly, with the language of truth, without trembling and without pleasing the world. Because otherwise we risk slowly, slowly slip into a serious error. The constant teaching about the family and the marriage is to be affirmed. Q: The Bishops of Poland have affirmed that Amoris Laetitia is to be read in continuity with the teaching of John Paul II. Cardinal Pujats: In my opinion, the teaching of St. John Paul II is correct and pure. It cannot be changed or changed. As I said, it cannot be changed, and I think it needs clarification.